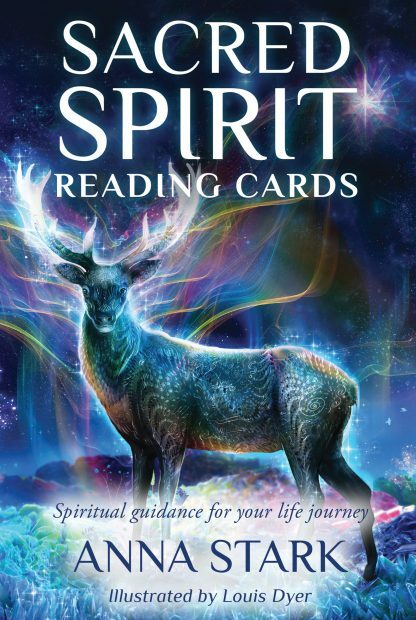 Sacred Spirit Reading Cards is a deck of 36 cards of visionary artwork that will help you look beyond the physical realm and connect to higher vibrational energies to empower your spirit with confidence and direct you toward a positive life path. A supportive tool for professional therapists, well-being modalities, and healing practitioners in all areas of energy medicine, these cards will uplift your spirit and soul and help awaken your higher self so you can create clear celestial connections for inner guidance. Included is a detailed guidebook with affirmations, celestial angels, healing crystals for self-awareness, and energy tips to enhance your intuition and self-healing abilities. Anna Stark is a spiritual practitioner and teacher who guides her students in understanding ancient systems of psychic healing and wisdom through elemental, angelic, and galactic realms. Anna holds a bachelor of arts in history and sociology and is trained in kinesiology, Usui Reiki, Seichem, and angelic Reiki healing. A traditional oracle card reader and energy healer, Anna travels extensively, sharing her work through teaching workshops and courses, aiming to create powerful changes in her students with sacred influences of esoteric healing, guided by the foundation of the Sacred Power Reading Cards.